The industrial revolution marked a huge change in history; the beginning of an exciting journey into an era filled with growth. This new era meant change, change in how things were manufactured, and the speed at which they were completed. Every aspect of life would change and improve as hand production moved to machine production increasing productivity and efficiency. The transition from hand production to machine began in Great Britain, and over a few decades made its way to the United States. This move boasted an improvement in water power, the increase in steam powered production, and the creation of machine tools. When pondering over this time period, the 18th and 19th century’s images of large machines operated by steam may come to mind. Large, bulky and metal might be a few adjectives that could describe this era, but not words such as beautiful, unique, full of ambiance and creativity. 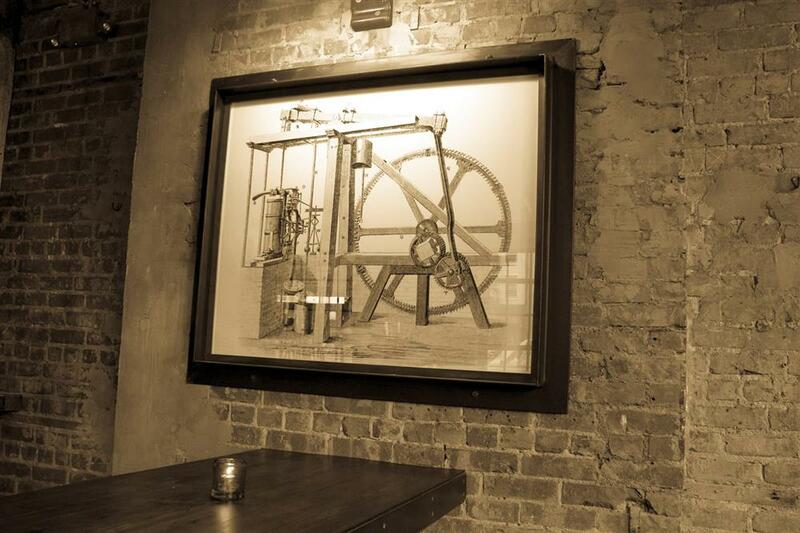 Though one may not consider the industrial age to be a thing of beauty, one’s opinion may change upon entering Boulton & Watt in Manhattan, NYC. 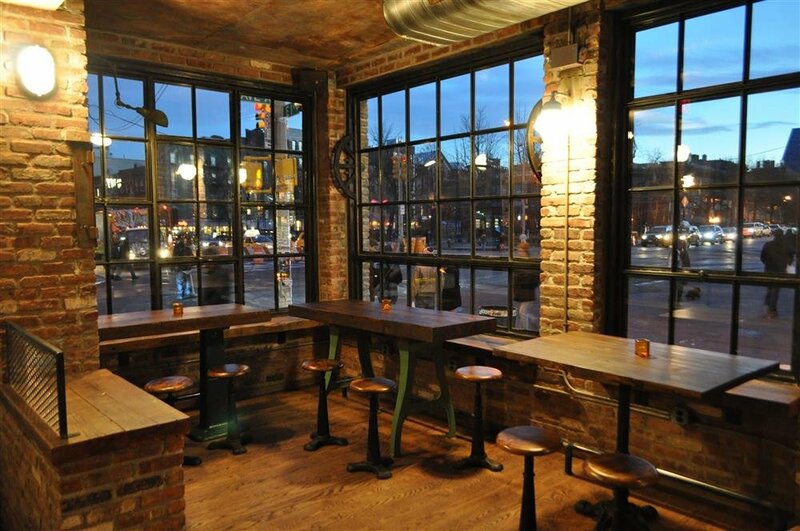 This historic Manhattan building has been home to several industrial businesses over the decades, but now it is home to a restaurant that honors and beautifies the industrial era – Boulton & Watt. This sign is a beacon to those who love amazing food and want to be wowed by their surroundings while they eat. Boulton & Watt will give them both. 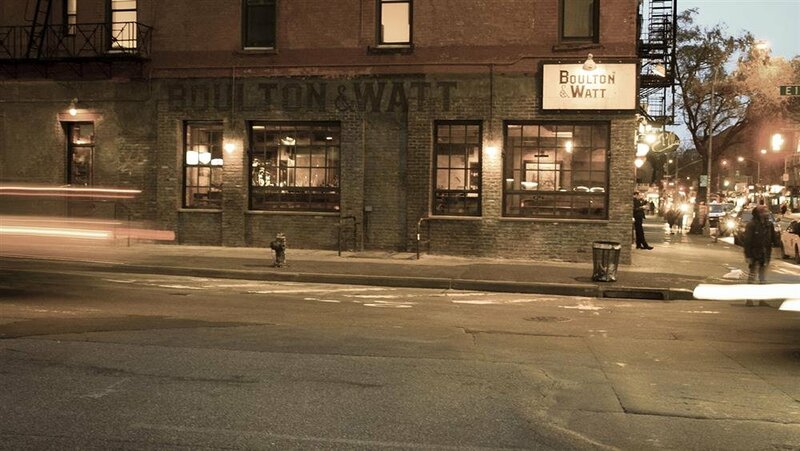 Boulton & Watt is a restaurant full of history and charm that can be found on a prominent East Village corner in Manhattan New York. The history behind the building in which Boulton & Watt resides dates back to the 19th century when the industrial revolution was making its mark in history. Before Boulton & Watt took over occupancy, the building was once known as the neighborhoods working factory and engine repair shop. Love and gratitude for this remarkable era is obvious to guests upon entrance to the restaurant. The rich history of the industrial era was carefully kept intact by the creative minds at Emporium Design. Emporium Design prides themselves on being a forward thinking design-build firm that specializes in creating unique spaces that complement the mind, ideals, and heart of each of their clients. Those looking to hire a design team that is not bound by in-the-box thinking are drawn to the Emporium Design firm. The goal of this company is to help create a lasting impression for everyone who enters one of their client’s buildings, and that is true of those who walk into Boulton & Watt. The image is the perfect complement to the wood and steel footrest stools, and various machine base table legs Olde Good Things provided for this design/build project. The wall art is ‘geared’ towards the theme. Walking into Boulton & Watt is like taking a trip into the past. The Emporium Design Firm wanted to preserve this building’s deep and prolific history, and so they designed the restaurant’s theme around the look, feel and history of the building. 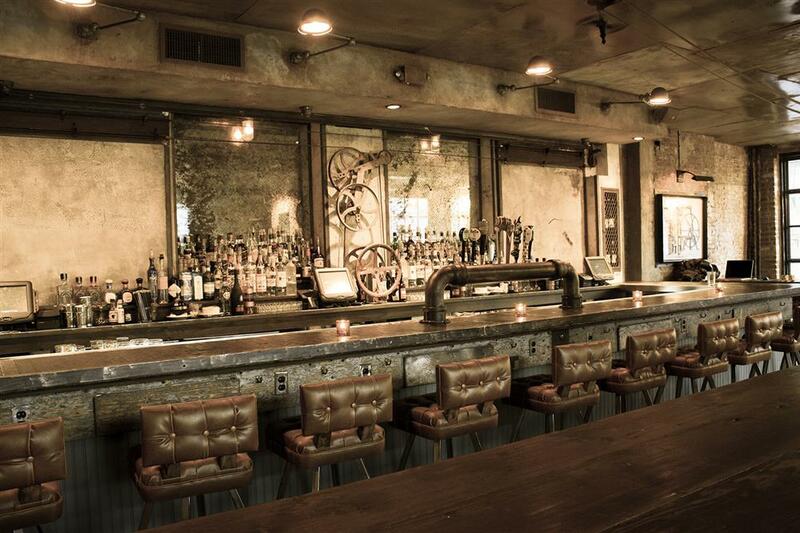 In order to achieve a complete industrial feel the Emporium Design team needed a little help. They had the ideas, the dreams, and the vision, but they also needed the design elements and materials to bring those dreams to life. We are one of the largest architectural antique dealers in the country specializing in historical artifacts from the nineteenth century and the pre-depression era. This makes us a popular choice for design projects such as the amazing design and build of Boulton & Watt. 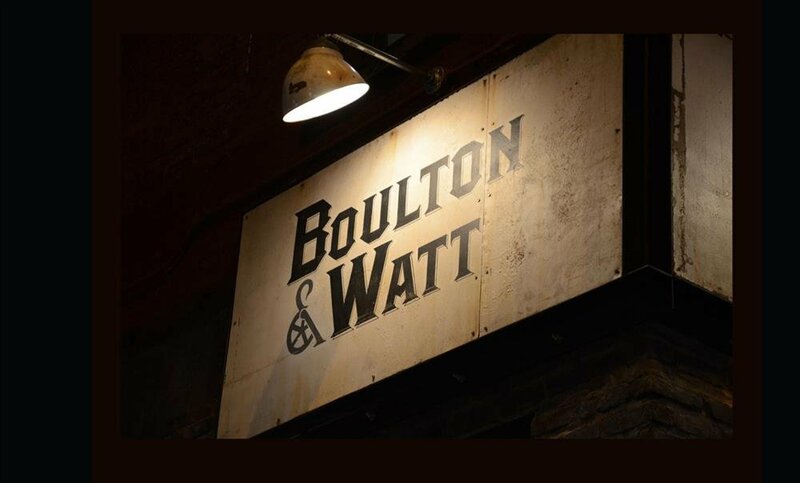 Part of the unique experience of eating at Boulton & Watt is sitting amongst, and literally on, history; history that has been gathered and displayed beautifully thanks to the keen eye of those that work for us, and the effort they place in locating and repurposing all kinds of antique items. The bar is where everyone seems to gather, and when that bar is in Boulton & Watt, it’s easy to see why; the distressed mirrored glass, and the gears that turn an Olde Good Things salvaged ceiling fan add a taste of the Machine Age. Industrial, adjustable singer stools are just one of the reclaimed items from Olde Good Things that can be found in Boulton & Watt. Wood and steel footrests compliment a uniquely fashioned table designed and put together from various machines that are true to the era being honored. Throughout the restaurant one can see little touches salvaged by Olde Good Things such as the glass behind the bar, which boasts a lovely distressed mirror and helps add a dash of industrial flavor from an earlier time period. 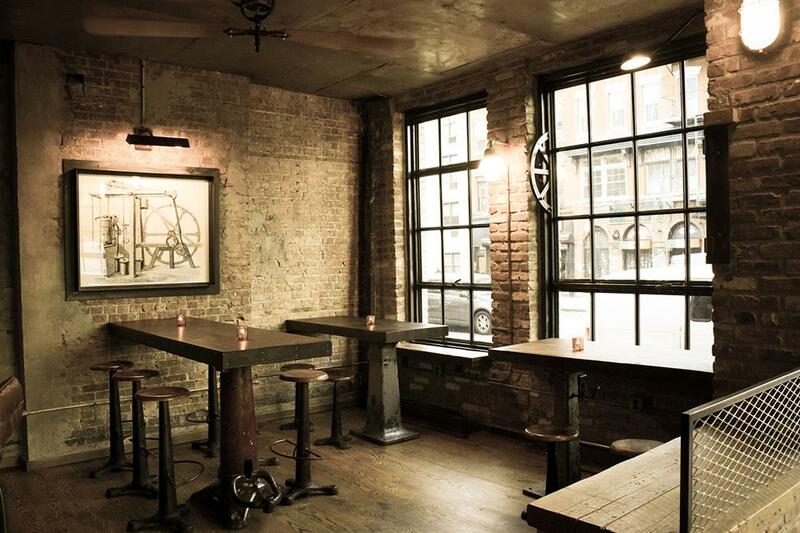 The Emporium Design team left no space untouched by history, to be true to the restaurant theme. 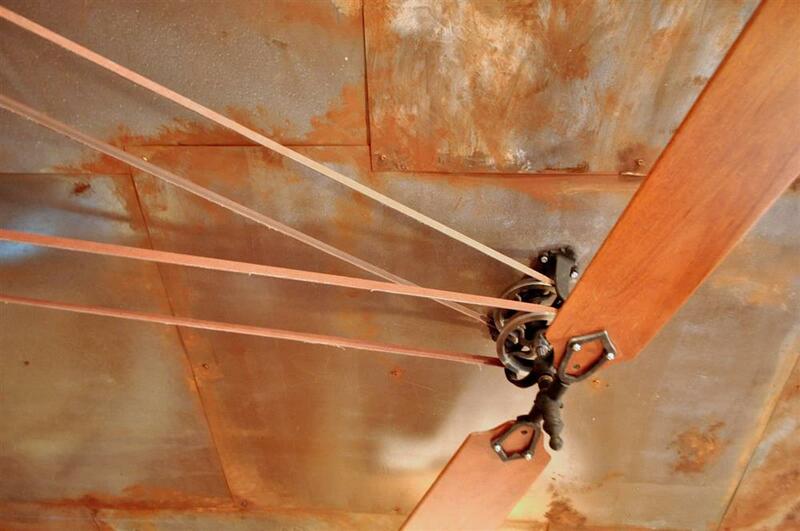 … to turn a large salvaged ceiling fan. 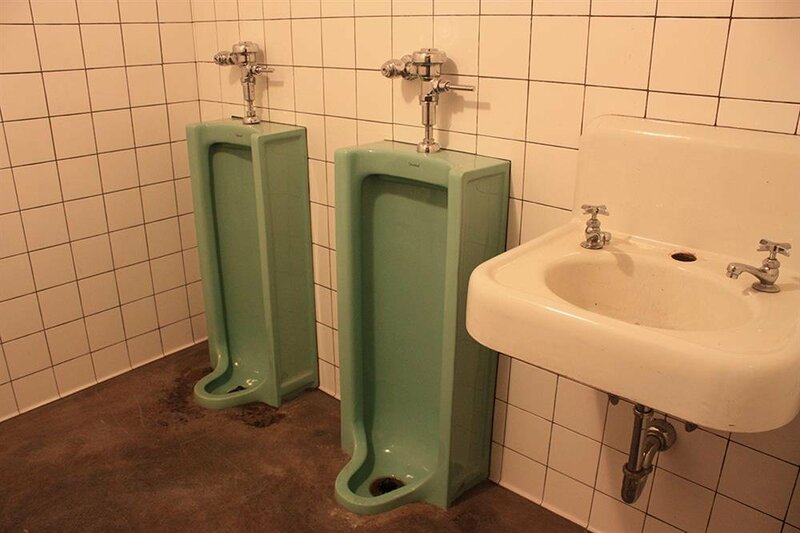 These mint green urinals are one of the quirkiest things Olde Good Things has salvaged. Not only do they have practical use, they are pleasing to the eye. Doorknobs, decorative iron, mantels and even salvaged urinals are just part of the unique items OGT has reclaimed and repurposed; when the designers at Emporium Design needed to complete the look and feel of the bathroom at this industrial themed eatery they knew they would find what they were looking for at Olde Good Things. 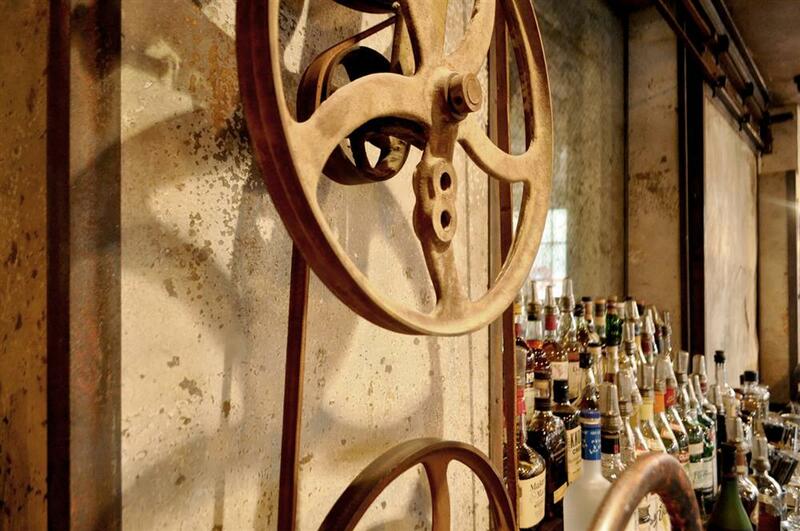 To truly accomplish a task as grand as an industrial themed eatery, it takes multiple individuals, teams, and specialist, to pull off such a feat; the people at Emporium Design and Olde Good Things accomplished their goal beautifully. Those that have the unique privilege of eating at Boulton & Watt would all agree that the atmosphere and décor reminds them of an exciting time in America’s history.